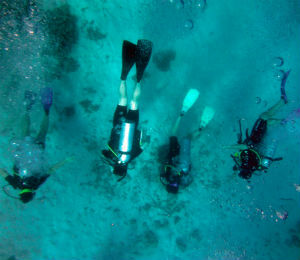 Key West scuba diving tours are a popular way for locals to spend a lazy Sunday, or for tourists to get to know the island. While some divers own their own equipment and are willing to pay baggage costs to bring them on diving trips, many others instead turn to rental shops to provide it for them. Like any service, shops have a range of prices and a range of quality in the stock they carry. While it may not be necessary to rent the most expensive equipment, neither is it advisable to rent the cheapest. It is often inexpensive for a reason. Rather than focusing on the rental price when looking to pick up scuba diving equipment, there are other factors that are more important. Maintenance and the age of rental equipment are critical when selecting what to rent. How frequently is the equipment thoroughly cleaned and tested for damage? How old is that equipment and is that number within manufactorer's safety guidelines? These are all essential questions to ask when renting equipment, and responsible vendors will be happy to go over this information with potential clients. A responsible rental shop will make sure to discard equipment that is not in optimal condition and periodically update their inventory. To do otherwise is irresponsible, and not worth whatever savings is being passed down to consumers. 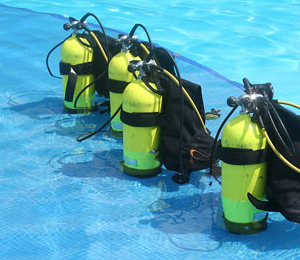 If possible, potential divers should try on rental equipment before making a choice. Equipment that perfectly fits one body or face may be uncomfortable on another person. 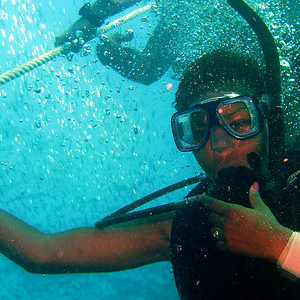 Masks and mouthpieces need to create a seal against a diver's face in order to ensure a smooth dive. Fins should fit and should also suit the style of dive that is being planned - split fins are better for longer, straight swims while paddle fins are better suited to dives near areas such as coral reefs, where the diver will be stopping and changing direction frequently. Diving equipment should not be one size fits all, and novice divers who do not have a preferred brand of their own should try to spend some time finding what works best for them. Research the brands of equipment being rented and verify whether they have a strong safety history. Research the dive shop as well, and see what other past divers have to say about their experiences. In this day and age of easy internet access, consumers are more aware and vocal than ever, so divers looking to rent equipment should take advantage of that information before making a decision on rental equipment. Rather than simply going with whatever equipment is cheapest, consumers should use the information they gather to select products that hit the sweet spot of affordability and quality. 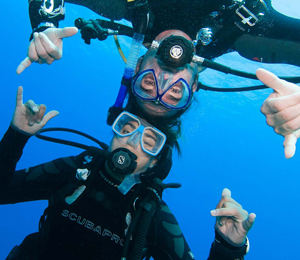 There is plenty of great equipment that is also priced well, but price shouldn't be the first, last, and only criteria for someone looking for a safe and fun diving adventure.